The moment I saw The Klingon Art of War at San Diego’s Comic-Con International at the Simon and Schuster booth I knew this was a hard back book I wanted to add to my small library of Star Trek books. While I have only had a passing interest in the variety of encyclopedias and tech books that are available, there was something about this book that instantly attracted my eye, and my mind. 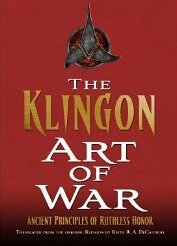 The concept of a book exploring the Klingon Art of War delighted me… I found myself instantly wondering ‘how has this book not been written sooner?’ The fact that it is a quality hard back book shows it is given the respect such a book would have been given by the Klingons. Before each precept is a beautiful piece of Star Trek / Klingon Art, and at the beginning of each “chapter” is a quote from Kahless that captures the character and spirit of the Klingons. It is a book I look forward to delving into. My first pass through shows that Keith R.A. DeCandido has explored the Klingon culture, and it’s warrior ways in a compelling manner, and presented it in a fun and accessible manner to fans of Klingons, and Star Trek. This entry was posted in Convention, Novel, Review and tagged Art of War, CCI, Comic-Con International, Kahless, Keith R. A. DeCandido, Klingon, PopArtsPlace, San Diego Comic-Con, SDCC, Simon & Schuster, Simon and Schuster, Star Trek, Star Trek The Next Generation, Star Trek TNG on August 5, 2014 by Kay.